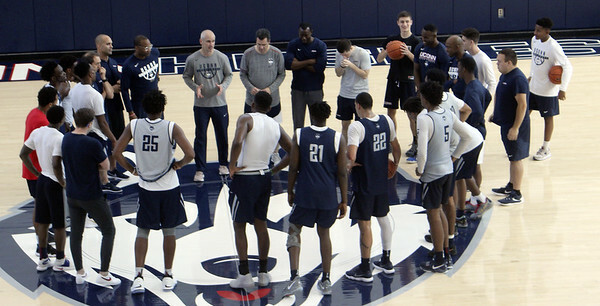 STORRS - Those who want to get sneak peek at coach Dan Hurley’s first UConn men’s basketball team should head to Gampel Pavilion on Saturday. The Huskies will hold a practice that is open to the public from 12:30-2:30 p.m. in the building. Doors to the building will open at noon and it is free of charge. Seating will be on a first-come, first-served basis. Fans are being asked to enter the arena through the North or East entrances. UConn will play a closed scrimmage against Harvard Oct. 27 and fans will get their next chance to watch the Huskies Nov. 2 in an exhibition against Southern Connecticut State. Husky great Scott Burrell, now the Owls’ head coach, will be honored before that game. Hurley, the former Rhode Island and Wagner head coach, is in his first season at the helm of the Huskies. The Huskies, coming off two straight losing seasons, including 14-18 a year ago under the fired Kevin Ollie, open the regular season Nov. 8 against Morehead State, also in Storrs. Posted in Newington Town Crier, UConn on Thursday, 18 October 2018 21:10. Updated: Thursday, 18 October 2018 21:13.